I went to school today. Oh well, as usual it kinda boring day ! Nvm it’s okay. I actually went for competition. 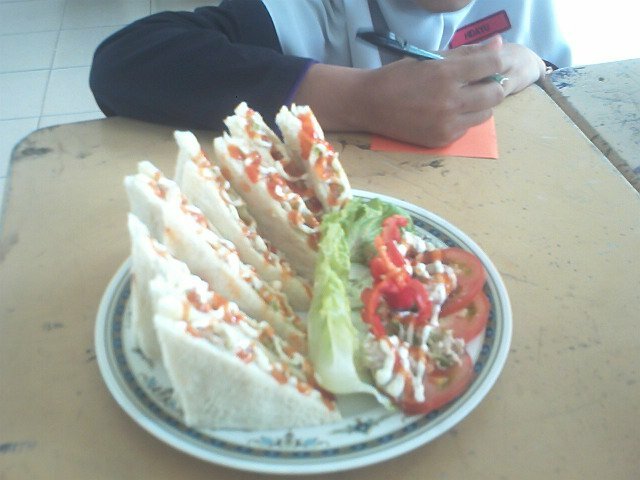 ‘ Sandwich Making Competition ‘ sounds cool aite? Haha yeah it was. This competition based on our skill, creativity, hygiene and cooperation. So around 8am, the teachers called all the participant to gathered in the school hall for the briefing. Just for 30mins. Afterwards, we started to make it. We only got 2hours for it. After everything was done, the judgers start to comment and taste it. ( Nervous part. LOL ) my group were so glad ! All the teachers liked it very much ! They commented on how delicious the sandwich was n the decoration. But urm unfortunately I’m not winning. A bit disappointed but still it was okay. Still proud we’ve done a pretty god jobs :P I’ve tried my best !